Be blessed by none other than the founder of Buddhism, Shakyamuni Buddha. Wearing this pendant will also bring his blessings to all who see it and plant the seeds of Buddhism in their minds. 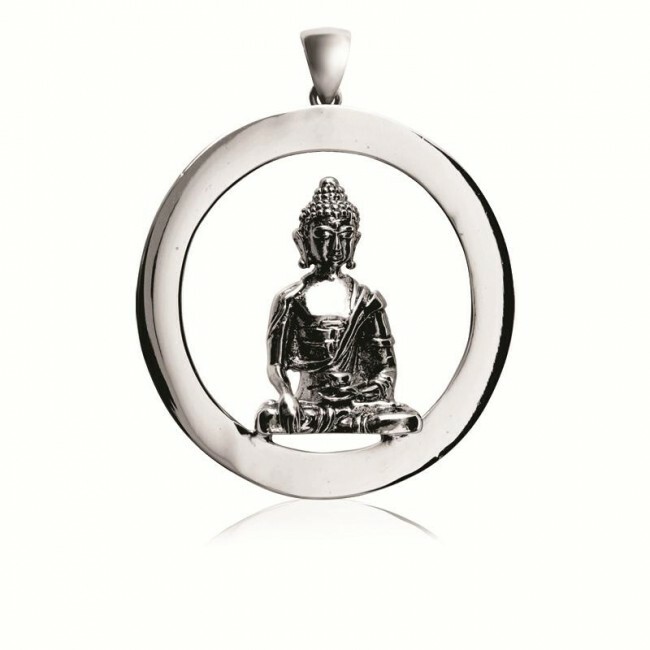 Bring Buddha Shakyamuni's blessings everywhere you go with this exclusively crafted, modern and elegant pendant of Shakyamuni mounted on a hollow round frame, in 925 sterling silver plated with 18K white gold. By employing diverse skilful means, the Buddha taught about 84,000 methods to Enlightenment, to suit all possible dispositions and spiritual levels of his students. Here, Shakyamuni is shown with his right hand lightly touching the ground beneath him, symbolic of his invoking the earth to bear witness to the truth and virtue of his actions and words.